Was the star of Bethlehem Satan’s Star? Chris: Joe, can you tell me why the Watchtower believes that the star of Bethlehem was Satan’s star and that the wise men were led by Satan? So you see Chris, the Bible shows us that the “star” that led the astrologers was Satan’s star and it was used to try to destroy Jesus. Chris: That’s an interesting premise Joe, but I’ve never seen it that way from Scripture. I’m wondering if you could answer some questions I have about the story of the star and the wise men found in the Bible. Joe: I am always willing to answer your Bible questions! Ask away. Chris: Let’s look at Matthew 2:1, 2. Chris: So Joe, according to those verses, where did the wise men see the star? Joe: It says they saw the star when they were in the east. Chris: Does it say that the star led them to Jerusalem? Joe: Well…no, it just says that they saw the star in the east. But it had to lead them to Jerusalem or else how did they get there? Chris: That’s a fair question- but let’s reason on it. Obviously they knew something about the Jews and their religion because the Bible says that they knew that the star was connected with the long-awaited king of the Jews. If they were aware of the Jew’s belief in a coming king, where do you think that they would look to find the king? Joe: Jerusalem was the seat of government. Chris: That’s right- it was the capital city and had the throne of King Herod as well. Logically Jerusalem would be the place to start their search for the king. Also the road itself led straight to Herod’s city so they had to go there first regardless. 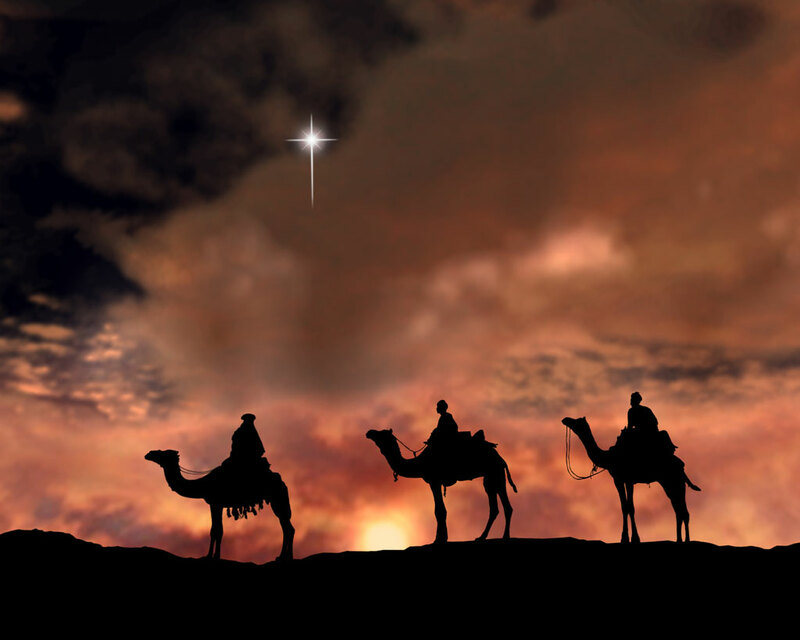 Do you know of any verses that say the star actually led the wise men to Jerusalem? Joe: Hmmm. Well, there aren’t any other verses that I know of. I’d need to do more research on that…But it only makes sense that the star led them to Jerusalem because Satan wanted Jesus killed. Chris: You know Joe there is a verse that talks about the star leading the Magi. Have a look at Matt. 2:9. I’m sure you’ve read it before. Chris: Joe, did the star lead the Magi to Jesus? Joe: Yes, it did. This shows that it was Satan’s star. Chris: But look at verse 12. Who gave the wise men direction in a dream? Joe: Verse 12 says, “However, because they were given divine warning in a dream not to return to Herod, they withdrew to their country by another way.” I’m familiar with this- here Jehovah warned the wise men to stay away from Herod to prevent him from killing Jesus. Chris: If the star of Bethlehem was Satan’s star, then Satan goofed! At that point he could have had the star take Herod and his army directly to the young Jesus. Who cares about the wise men at that point? Jesus would be in grave danger! But in reality that’s not what happened, because the wise men were obedient to Jehovah, but Herod obviously was not. Joe: The star couldn’t have been Jehovah’s star. There is no reason to send pagan astrologers to Jesus other than to stir up Herod to try to kill Jesus. Satan has always tried to foil God’s purpose. Chris: Joe, if the Magi were pawns of Satan and influenced by him, then they would not have obeyed Jehovah’s warning in a dream. The fact that they obeyed Jehovah seems to indicate that they were acting in accord with his will. And in ancient times, an astronomer and an astrologer were one in the same. So they were scientists of their time, and rightly could be called “Wise Men”. Joe: Agreed. But just because these wise men obeyed God in this instance proves nothing- he could have made them obey. Chris: Well it’s true, Jehovah could easily have stopped the wise men from finding Jesus- just like He stopped Herod from finding Jesus. But the wise men provided something vitally important that was needed- and in fact fulfilled an important prophecy about the Christ. Chris: Matthew 2:15 quotes a prophecy from God about His Son being in Egypt. And verse 18 is another prophecy quoted about the death of the young children that would be killed by Herod. It was no surprise to Jehovah that Herod would cause the death of many children in an attempt to kill Jesus. God already knew this and gave a prophecy to show that He was prepared for this event. How would Jehovah provide protection for Jesus? Joe: He sent Jesus and his parents into Egypt. Chris: If Jehovah already knew that his Son would need to go to Egypt just as was prophesied, what did He prepare to provide financially for his Son in Egypt? Weren’t they quite poor? How could they afford to ever make such a trip? Joe: I’ve never thought of that question before. I don’t know. Chris: Just think, Joe. The wise men brought very expensive gifts to the young child Jesus. These gifts were worth enough to finance the stay in Egypt of God’s Son. These men brought a financial provision for Jesus in direct line with Jehovah’s will. It was not until after the Magi left that Jesus’ parents were instructed to flee to Egypt. Now Joe, whose star do you think the star of Bethlehem really was? Joe: Well like I said, I’d like to do more research on this topic. Honestly, I’ve never looked at it this way before. Thanks for your time Chris. Have a good day. Chris: I will! Have a good day yourself. A PDF version of the story can be downloaded here. Absolutely logical and very well presented. Thanks JJ. I must admit that the point about providing materially for Jesus and his family’s trip to Egypt was something I’d never thought about. This shows how important it is to allow information to come from various sources. If you confine your source of information to just one place, you leave yourself bound to the knowledge and understanding of just those people behind that source. Okay everything sounds logical and I can’t really argue against it at this stage. But am I the only one that feels uneasy, not about the logic presented in this argument, but the link to the site is in my opinion trying to get us to return to the ‘vomit’ of previous teachings. For example, they use the same reasoning technique to establish that Xmas is okay to celebrate. Now I don’t care how much supposed logic they use, I’m not buying that. Even pundits who celebrate Xmas know the origins of it. I have a newspaper clipping for crying out loud, that has a headline “Have a merry Xmas you pagans”. This was taken from a National newspaper in my country and I used to use it on the ministry around Xmas time to overcome any objections about JW’s not celebrating Xmas. So, although I can’t put my finger on it, I’m wary about anybody who tries to lead me down a road that I feel is wrong, no matter how good their rationale may be. After all deception is about making somebody believe something is true although it is false. For me the real question is this: Why do they *need* that star to be Satan’s construct so much that they ignore all the contrary evidence? What is really going on with them that they need to do that? Well you are to be commended for your honesty, and for simply reading and accepting what the scriptures say. But your reaction was much like my own at first. “WHAT? That can’t be right!” I felt that way because I didn’t WANT the Star to be from YHWH I wanted it to be from Satan. But the reasoning and the scriptures were right there all along. And they are compelling, at least to you and I. Now taking this all the way to “Let’s now say it’s OK to celebrate Xmas” is nowhere in the article. And I am not comfortable personally celebrating it. The article is not about that. But it helps us to see that if anyone is “mentally diseased” it is not us- it is the people that insist we only study, think, and believe one way- THEIR WAY. This is yet another example of where the WTO has gotten it wrong, but will never change, nor will they allow others the use of their Christian conscience. That is the difference brother, and it’s a huge one. Intelligent and honest article brother, thank you. JW Struggle; nice blog post! Our family came to the same conclusion last year during our home study. The Magi had to take the main road going through Herod’s city to get to Bethlehem; not necessarily by the star’s direction, and defiantly not by Satan’s! The shepherds were to report a holy event seeing the star, and the angels sang and danced around it; so the Magi seeing it wasn’t bad in it self. if the star was a real star then how could it have stoped over jesus its not possible also if they were following it then was it a comet? they cant stop eaither,a star so close to earth would cause real problems with our earth to begin with,so its a star only the wise men could see and no one else as they read the stars on all matters,so why would god let the devil do that at all he wouldnt have just let that happen unles there was a purpose and not a bad one but a good one.so the star was only seen by them no one else?tell me if im wrong did anyone else in the bible say they saw this star and followed it? why would god let that hapen he wouldnt he was protecting jesus from the begining and so they went for his purpose not any other.the star wasnt a sign that all could see was it am i wrong, im just wondering, was it just for them kings and so it was just in there mind in there prediction on the stars in general not a real star moving, as they dont do that unless they comets or sumat and cant stop,the devil didnt send no star in my opinion there wasnt a star it was just predictions my these men from all the stars that they read and god gave them this one so they could give em what they needed to go egipt and so forth i agree with the post but only on my own logic, so being me im prob totaly wrong. AwareBeing: Thank you for the point about the main road leading directly to Jerusalem- I incorporated that into the dialogue. And while I’m on the subject of celebrations, even though I still would not feel comfortable celebrating birthdays, I never found the WTS appeals to scripture convincing. I remember having real difficulty when I was young defending that belief. So something awful happened on Pharaoh’s birthday? Well, something good happened as well didn’t it (remember the cupbearer)? So one cancels the other out and it can’t be used as evidence at all in my opinion. So what are we left with? One, yes I repeat, one instance involving a birthday that was pretty bad. I think the point of recording the event in the Bible was to show how bad Herod was not how bad birthdays were. I wonder if we should outlaw anniversaries, because I’m sure there must have been at least one occasion in history where something awful happened during someone’s wedding anniversary?! I also agree with JWB’s last post regarding both xmas & birthdays. When I was still within the org. I could never accept their reasoning on birthdays, however for the sake of survival I went along with it. It’s good to now be free to believe & practice that which I see to either be correct, or that doesn’t have a negative basis in scripture. Nice article. Check this out. THE STAR OF BETHLEHEM (2009): Frederick A. Larson is an excellent DVD that can be ordered on Amazon.com. It will answer Serein’s questions and give you chill bumps–especially the bonus trailer. I doubt that you will ever think about the “star” the same way again. It is most likely that since the wise men wanted to worship the King of the Jews that they were Hebrew descentants of those associated with Daniel who was the chief wise man in Babylon; nevertheless, if Matt. 2:2 is taken for what it says, the star belonged to Jesus, the King of the Jews. It is so blessed to be able to read all the wonderful posts of all the precious seekers of truth from the pages of the Word. Thy WORD is TRUTH. 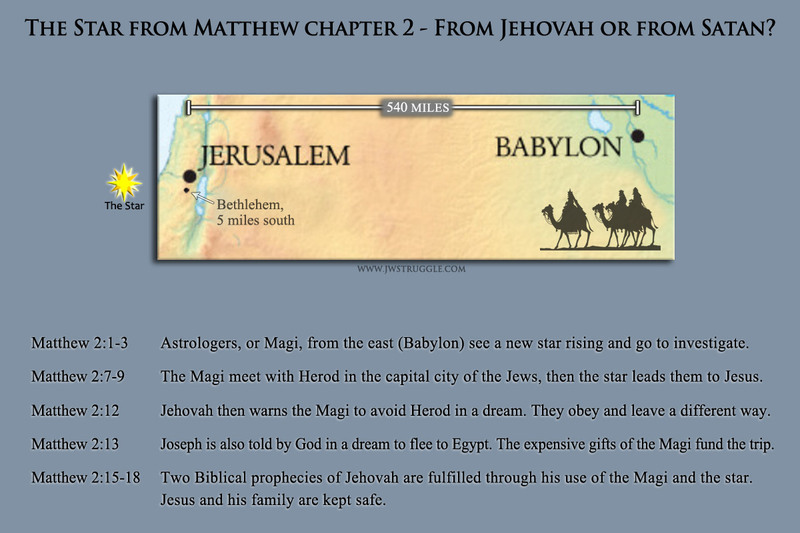 A former chief of the Magi may have ordered this trip many years before, a man with a knowledge of Jehovah’s promises. In the story of the nativity play, the star from the East, is always spoken of as being sent by God. However, if you take a closer look at the Bible, you will see it was not God who sent it. It seams to me, Satan sent this star to try and kill Jesus, but God’s angels were watching out for him. So he survived this attempt on his life. I have been commenting here as Chris almost from the start of JJ’s site. To save confusion can you please get another moniker for yourself if you wish to continue commenting. I don’t know but can add some wood to the fire. I question this being a true star, because of the angle change [Jerusalem-Bethlehem], this tends to make me think of an atmospheric star like light put there by Satan – Satan may have power over the kingdoms of the Earth but distant stars? Or if a real star, could it be two different stars with some lense like trick? Or did this star stay over Jerusalem & Bethlehem, while other stars crossed the sky normally, as if another pole star? The sky rotates 15 degrees per hour, telescopes have to gently track this movement. Only the pole stars can be followed by travellers.